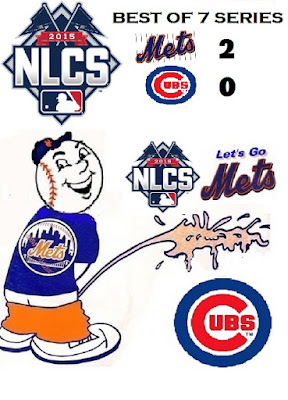 ajgmets.net: NLCS Game 3 is upon us ..
NLCS Game 3 is upon us .. Along with the Mets arrival in Chicago came a batch of weather forecasted to be in the upper 60's to mid 70's with no rain. This in direct contrast to the 30' and 40's the teams had to deal with in NY for games 1 and 2. Hopefully the Mets pitchers can keep the Baby Bears big bats(ranked 3rd in NL in HRs at home) in the park. The Mets come into this 3rd game tonight with hard throwing Jake DeGrom looking for his 3rd playoff win against the Cubs' Kyle Hendricks who pitched 4-2/3 innings against the Cardinals in Game 2 of that division series, giving up 3 solo home runs. As Always LET'S GO METS !! !